You’ve decided that you’d like to move beyond backyard bluebirding, and start a trail. A bluebird trail is nothing more than a series of nestboxes. They can be arranged in anyway that makes sense for you, but are often in a line, circle, square or grid pattern. Here are some suggestions on how to get started. Make sure you are willing to commit the time and the resources ($) to properly monitor and maintain a trail. The amount of time and expense will be determined by how many boxes you have, where you get them from, and how far away and apart they are. Plan to spend at least a couple of hours a week monitoring your boxes. 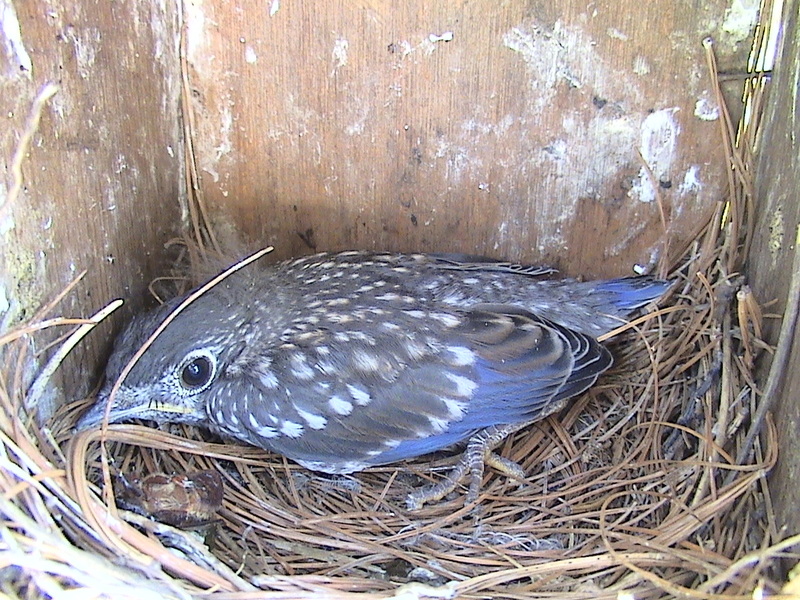 If you put up boxes and forget about them, the birds you have invited to nest are exposed to risk (predators, weather, etc.) and you may end up creating House Sparrow slums that threaten the survival of native birds you were trying to help. Get a good book like The Bluebird Monitor’s Guide as a resource. The more you know, the more successful your trail will be, and the better prepared you will be to deal with the inevitable problems that will arise. Read through the Bluebirding Basics on this website. Figure out where you will put the boxes. If you’re lucky, you own some suitable habitat. But some trail monitors don’t have a single box on their own land. Enlist neighbors, or ask the owner or manager of a park (nature or corporate), golf course, cemetery, farm, or other location that bluebirds and other cavity nesters would be drawn to to consider granting you permission to put up some boxes. You might want to show them a photo of a typical set up, and give them an informational handout so they understand why you are doing this and what to expect. Give them your name and phone number so they can call you if there are problems with a box, etc. Also, consider adopting an abandoned trail. Many well meaning people put up boxes and then don’t monitor them, or organizations don’t have the staff to do it. Also, some older monitors need a successor (check with your local/state bluebird society.) Of course, check with the property and box owners first. Avoid areas where killer House Sparrows are common, or prepare to control House Sparrows. Avoid House Wren habitat. Get some nestboxes. You can make your own, buy them, or try to convince someone to donate them or make them for you (Eagle Scout project?) Consider starting small while you are learning – say five or six boxes. Many trails eventually grow to 20-200 boxes, although some have thousands! Boxes should be properly designed (with correct hole size) for small cavity nesters you want to attract, with a door or roof that opens for monitoring and cleaning, and be solidly constructed so they will keep rain and predators out, and last for years. Figure out how you will mount the boxes (on electrical conduit, fence posts, hanging, etc.) Separate the boxes by at least 100 yards (Eastern Bluebirds) 200-300 yards (Mountain Bluebirds) or 100-300 yards (Western Bluebirds), or pair boxes 5-18 feet apart if you want both Tree Swallows and Bluebirds. Install the boxes with appropriate predator protection. To maximize use of boxes, ideally do this in the early spring before nesting begins, or in the late fall. Pull together a monitoring kit – the basic equipment you will need. Monitor the trail regularly (once or twice a week during active nesting season), and keep records. Clean boxes out after each nesting. Share your results with the people who let you put up boxes on their property, and local or national birding organizations that collect this data to further our knowledge about native cavity-nesters. Get the boxes ready for next year. Before nesting season begins, make sure boxes are in good condition and are clean inside. You may have to do some other chores like getting rid of paper wasps. And have fun!